eBay seller tunghori has loaded up his eBay store with the latest The Vintage Collection figures including Lando Calrissian (Skiff Guard) and Ree-Yees among others! Special thanks to JTA reader Mark for the alert! Now that you have your new Lando from Walmart online, why not complete him with the MULTIPLE accessories from 2012’s TVC Lando Calrissian (Sandstorm Outfit) (VC89) figure. Sadly, it doesn’t look like this one has the skiff guard blaster either, but I can’t be 100% certain. Special thanks to JTA reader and friend Mark for the alert. ← TVC Lando Calrissian (Skiff Guard) Arriving To Homes! Randomly searching for some missing items needed for my collection on eBay, I couldn’t help but notice that toys for The Force Awakens list for much lower than The Power Of The Force “2” era Hasbro toys. Sure, adds a premium to older products, but all of the stuff from 1995-2000 were a dime a dozen. eBay seller tunghori added the TVC Cloud Car Pilot to his store today if you’re interested. Special thanks to JTA reader Mark for the alert! This is NOT an endorsement or a suggestion to order, but this eBay seller has the Jabba’s Palace Adventure Playset for $15.99 and FREE shipping from China. And they’ve sold a ton of them so far. Something is rotten in Denmark, huh? ← International Collectors! HasLab Jabba's Sail Barge eBay Page Live!! Walmart Exclusive TVC Jabba's Palace On eBay! And if you’re too impatient to wait for Walmart to put this on sale, you can get it for an elevated price on eBay right now! ← First Look! Walmart Exclusive TVC Jabba's Palace Adventure Playset! International Collectors! HasLab Jabba's Sail Barge eBay Page Live!! Order the HasLab Jabba’s Sail Barge from hasbro-pulse eBay seller now. For international collectors only! Hasbro Cancels The Entertainment Earth Saved Force Link 2.0 C-3PO/R2-D2 Two-Pack! Holy cow. The former Toys R Us exclusive C-3PO/R2-D2 Force Link 2.0 pack that was saved by Entertainment Earth is now canceled. eBay might be your only option for this at this point. This is a shame because it is the most beautiful thing in the entire Solo line. Thanks to JTA reader and friend Josh M. for the alert. ← Important Update: International Jabba's Sail Barge Order Time Confirmed! TVC Luke Skywalker (Endor Capture) (VC23) On eBay Loose! It’s not the latest version with “photorealistic” technology, but you can get the popular Luke Skywalker (Endor Capture) figure on eBay loose for $13.99. ← Everything You Probably Don't Know But Need To Know About The Updated 2019 TVC Princess Leia Organa (Hoth) (VC02) Figure! Important Update: International Jabba's Sail Barge Order Time Confirmed! Our friends at Bantha Skull have reached out to Litzky PR to lock down a time when the international supply of Jabba’s Sail Barge goes up for order on eBay. They write “Limited quantities of Hasbro’s The Vintage Collection Jabba’s Sail Barge will be available to purchase on the official Hasbro Pulse Ebay page (sponsored) on Thursday, 3/28, at 3 PM EST (7 PM GMT). Please note, orders of more than 1 Barge or any orders with a US or Canadian shipping address will not be processed.” Click the image below for a direct link to the auction page. A few Lando Calrissian (Skiff Guard) figures remain from a seller from Taiwan if you feel like you need it now. Five Lando Calrissian (Skiff Guard) figures are available early from Taiwan if you feel like taking the chance. ← eBay Allotment of Jabba's Sail Barge Imminent From Hasbro Pulse? Here is the eBay listing for the HasLab Jabba’s Sail Barge from hasbro-pulse eBay seller. UPDATE: I don’t know what to think of this eBay auction anymore. At least you can’t order these, so no one is in danger of a scam. But this is odd. eBay Allotment of Jabba's Sail Barge Imminent From Hasbro Pulse? JTA reader Ed D. found a listing on his eBay application for Jabba’s Sail Barge (The Khetanna) under eBay seller Hasbro-pulse. They don’t have any listings when you search by seller, but it looks like this going for sale online is imminent. ← Attack Of Jabba's Sail Barges! eBay Seller tunghori Lists TVC Mimban Stormtrooper Clean "Variant"!! Check this out! eBay seller tunghori has listed a Mimban Stormtrooper “variant.” It’s missing all of its deco which leaves you with a slightly revised super-articulated Original Trilogy Stormtrooper. Is it a factory reject? Or is it part of a new exclusive release? They’re expensive, but it might be cool to have in your collection! Special thanks to JTA reader M. Nguyen for the alert! Hold Jabba's Sail Barge Ransom For 100 Billion Dollars! The madness ensues. Those who missed out on the HasLab campaign and are desperate to own it are bidding VERY HIGH for it on eBay. Check out this auction. Thanks to friend Russ T. for the alert! ← RUMOR: Obi-Wan Series In Development? The Power Of The Force "Too" Expensive! Ouch! Have you checked the prices on various POTF”2″ stuff recently? Because Research Droids Reviews are winding down to a close, I felt obligated to add some key items that currently are missing from the database. As I don’t have a lot of the items anymore, it necessitates rebuying them…. on the eBay aftermarket no less. Believing that POTF2 stuff has always existed in a “dime a dozen” fashion since its inception, I was shocked to see the prices sellers are trying to get on this classic gold. See it for yourself! Oh man, folks, I don’t know if I am getting to that Millennium Falcon! Kessel Run Millennium Falcon 50% Off At HTS' eBay Store! If you’re interested, Hasbro Toy Shop’s eBay store has the Kessel Run Millennium Falcon for 50% of! Special thanks to JTA reader Sean C. for the alert! HasLab Exclusive Yak Face Auction Ends Right Below $400! We’ve been keeping a close watch on the HasLab Jabba’s Sail Barge Yak Face figure. This auction ended at $381.88. This means he only paid $118.12 for The Khetanna. I am pretty confident that we’ll see auction topping off anywhere between $500-$750 in the future, once word continues around the community that this figure exists. They should be shipping for us all soon. I hope you’ll enjoy yours without any worries over aftermarket value. Are You Selling Your Yak Face For A Quick $$$ Turnaround? Here we go! Some people who backed the barge are now “dumping” the included and super-rare Yak Face figure with the coin on eBay. Bids are traveling high. If you nacked the barge, are you selling this figure too? Or will it be treasured forever? Now-Canceled Solo Line Wave 4 Available At HTS' eBay Store! Retail is clearancing out the Star Wars [Solo] wave, and so many collectors have yet to see a single character from the film on pegs. Hasbro Toy Shop’s eBay store has the last wave in stock if you’re quick. These figures MAY show up on clearance somewhere down the road, but you know what they say about last wave syndrome…. Special thanks to JTA reader Shawn P. for the alert! tunghori Restocks Loose Samples Of Yak Face, Klaatu Skiff, Leia Boushh Etc. tunghori has once again put up The Vintage Collection Yak Face wave up Special thanks to JTA reader and friend Mark for the second alert! TVC Saelt-Marae Wave Up On eBay Courtesy Of tunghori! tunghori put up The Vintage Collection Yak Face wave up(loose)! Special thanks to JTA reader and friend Mark for the alert! ← TBS6 [P3] General Grievous Up For Pre-order! 2015's TBS [P2] Jabba's Rancor Pit For Original MSRP + FREE Shipping! If you missed out on Jabba’s Sail Barge, but still want that sculpt of Jabba The Hutt? Did you never secure a rancor? Did you miss out on the never-to-be-shipped-again Slave Leia action figures? Well, you can get the former Toys R Us exclusive Jabba’s Rancor Pit from The Black Series [Phase II] line for its original MSRP on eBay now! UPDATE: They’re all sold out, but we changed the link to see if any others come up for a reasonable price. ← HURRY! TVC Mimban Stormtrooper BACK IN STOCK! Cheap Loose Super-Articulated FO Stormtroopers On eBay! If you’re looking to army build super-articulated First Order Stormtroopers, there is a cheap lot of them on eBay. Special thanks to JTA moderator Sjefke for the alert!! ← The Vintage Collection Wave 20 (Wave 4) Shipping In UK! eBay has posted another coupon, good for today only. Use code POPUPSAVINGS during checkout to take advantage of this deal. ← "The Final Countdown" Is Completed! Vintage Kenner Wrap-Up Next! Yak Face And Klaatu (Skiff Guard) On eBay! The Vintage Collection Yak Face and Klaatu (Skiff Guard) loose samples are in stock on eBay as of this posting! Special thanks to all who wrote in to let us know! eBay continues to roll out daily coupon deals, with today’s coupon getting you 15% off. Just use code PICKUPSALE by 12 am PT. Make sure to hit up popular eBay Star Wars stores like Hasbro Toy Shop to take advantage! 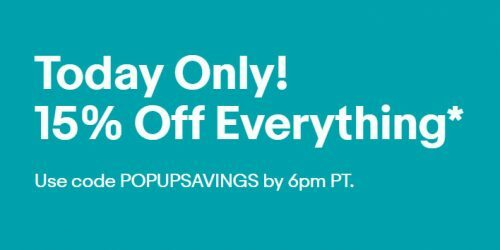 New eBay PROMO CODE Today Only! eBay is offering another promo code today. Hurry, it expires soon. Get 15% off toys and video games today. Use promo code PLAYTIME15. You might as well start at Hasbro Toy Shop! If you’re interested, they have the new Galaxy Of Adventure Figures and Mini Comics if you’re interested! If you have some eBay shopping to do, take advantage of today’s 10% Off coupon code. You can start right here in the Hasbro Toy Shop eBay store! Coupon expires December 8 at 3 am PT. Use coupon code PHLDAYTEN. eBay currently has a 10% off coupon good for all toys. Click through for details, and jump over to the Hasbro Toy Shop store to see if there’s anything you need. Use coupon code PLAYDAY. It expires at 11:59pm PT. HURRY! Que-Mars Redath is IN STOCK loose on eBay! Special thanks to JTA reader Mahn-Thai N. for the alert! It's Back! Que-Mars Redath IN STOCK Loose On eBay! HURRY! Que-Mars Redath is BACK IN STOCK loose on eBay! HURRY! Que-Mars Redath IN STOCK Loose On eBay!